Marktech offers three series of high reliability metal can packages and plastic emitters all in the visible range. These include Hermetic cans that incorporate Cree’s robust LED die. Our “Cree in a Can” devices combine Cree’s highly efficient InGaN materials with proprietary substrates to deliver superior performance for high intensity LEDs. This series includes TO-5, TO-18 and TO-39 packages on flat or domed lenses. Marktech’s manufactured line of metal cans highlight our precise centering capabilities within each package which is a key component to critical illumination, machine vision, and scanning applications. Marktech can also customize our emitters to your specific needs including wavelengths and power output. Our Visible Plastic Emitters differ from standard LEDs in the way they are packaged to optimize mechanical and optical alignment. Our emitters are measured for power output in watts and peak wavelength as opposed to candela and dominant wavelength for standard LEDs. 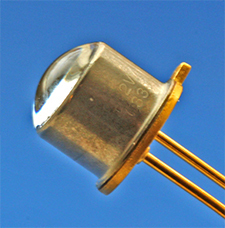 These devices are optimized for operation with photo diodes. No matter your application, Marktech’s experienced engineers can help you select the emission components to meet your needs. And in addition to the numerous packages listed here, Marktech can custom design single or multi-chip packages or modules and manufacture them within our facilities.